Super fast checking domains for Moz and Majestic metrics. Lookup as many or as little as you need. End anytime. Optionally include domain spam checking by Spamsy as well as further domain refinement by Ahrefs and SeoProfiler. 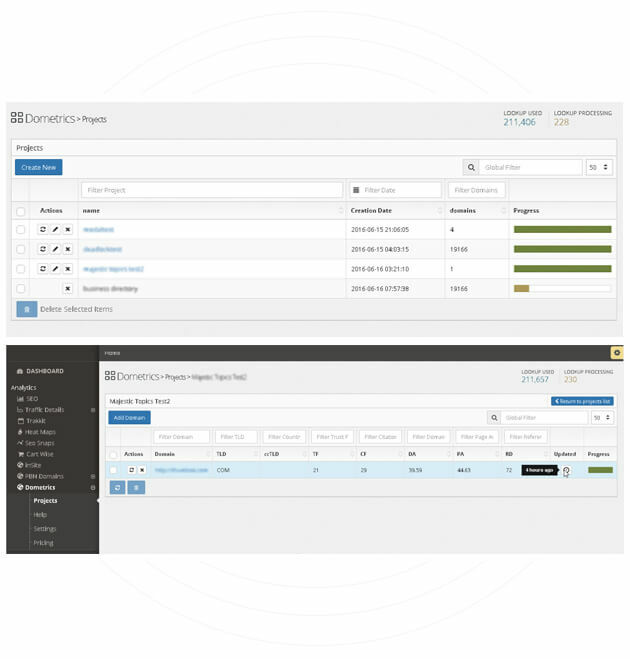 Dometrics Domain Checking Features Quickly assess your domain authority via our API or web based panel. No need for dedicated servers, local software, or other expensive resources. Get the stats on all of your domain prospects immediately with no time delay between checked. Your job is queued and results are provided quickly allowing you so direct your valuable time to other activities. Whether you are an expert or just a beginner – finding quality domain names is fun, rewarding and has huge upside. Don’t worry about ‘use it it lose it’ credit systems. With Dometrics your unused credits carry over to the next month. Addons like Spamsy, aHrefs and seoprofiler allow extra filtering criteria to ensure high quality spam free DA/PA domains! With direct payment options as well as PayPal, subscribing to our service is safe and secure! Metrics Providers Available Select one or more providers as part of your results. What is Dometrics? And why do I need it? Dometrics is a website domain checking service that utilizes the metrics of Majestic and MOZ to provide you with the domain authority of a domain. Optionally you can include metrics also from aHrefs and SEOProfiler to fine tune your results and provide further filtering profiles. And when you couple your domain campaigns with Spamsy you can prefilter your domains list to avoid wasting lookup metrics credits on junk domains. Spamsy plays nicely with Dometrics and any experienced Domainer will tell you that you must check domains for a history of spam. Dometrics Benefits Dometrics offers you more metrics data points, assessments and faster results than any other DA/PA checking service, and it's much less expensive than paying for each service standalone! As much or as little data as you want to know about a domain. Online account panel or by our easy to use API. aHREFS , SEOProfiler, Spamsy Metrics Too! Improve your results and granularity, filter out garbage domains. Dometrics Pricing Packages From thousands to hundreds of thousands of queries, we have a package for everyone. Dometrics is a professional domain quality checking systems, which allows you to lookup domain names in bulk and see each domain metrics result as a value. Which metrics can I use? At the moment we include Majestic and MOZ as part of the core service. What about aHrefs and SEOProfiler? You can add them but they aren’t included in the core service. When you decide to bundle aHrefs or SEOProfiler as part of your domain quality checking we offer you a nice discount. You can also addon Spamsy spam filtering which will also check the domain(s) for historical spam abuse with things like Chinese characters or a whole host of word filters so you can be sure the domain you’re getting is the best possible quality. What if I don't use all my lookup credits? The present month credits will roll over to the next, but please be sure to use them all up because roll overs only are good from one month to the next, they don’t accumulate. You can pay us directly by credit card (VISA/AMEX/Master Card/Discover) and also Paypal. We’re fully PCI compliant so your personal information and card data is secure. This is a great service, why haven't I heard of you before? We decided to make public these apps and tools we’ve used ourselves for years. Sharing the love. Our policy is easy; love us or leave us. You can cancel your subscription at any time. If you have remaining credits and cancel your service, we will prorate your unused credits and buy them back from you. No worries. Just flick us an email to the helpdesk and let us know. What our clients say about Dometrics Read what users have to say about working with us. I’ve been beta testing the cool stuff these guys make for about two years now. The code is solid, the service fantastic, and the results more than worth my investment. I’ve been using expired domains now for more than a year and prior to the apps these guys produce I lost a lot of money on junk domains. Love you guys (really)! I was skeptical about the results of domain harvesting at first but since using Spamsy and expired domains together with Dometrics I’m super happy! Moz and Majestic domain stats on a budget Check as many domains as you want as quickly as you want. To download the full version of the program, just fill in the details below! When it comes to expired domains, metrics and finding quality domains worth registering nothing beats the simplicity and ease of Dometrics. Copyright ©2016-2018 Dometrics - Official Website. Powered by Creationshop Affiliate and eCommerce.